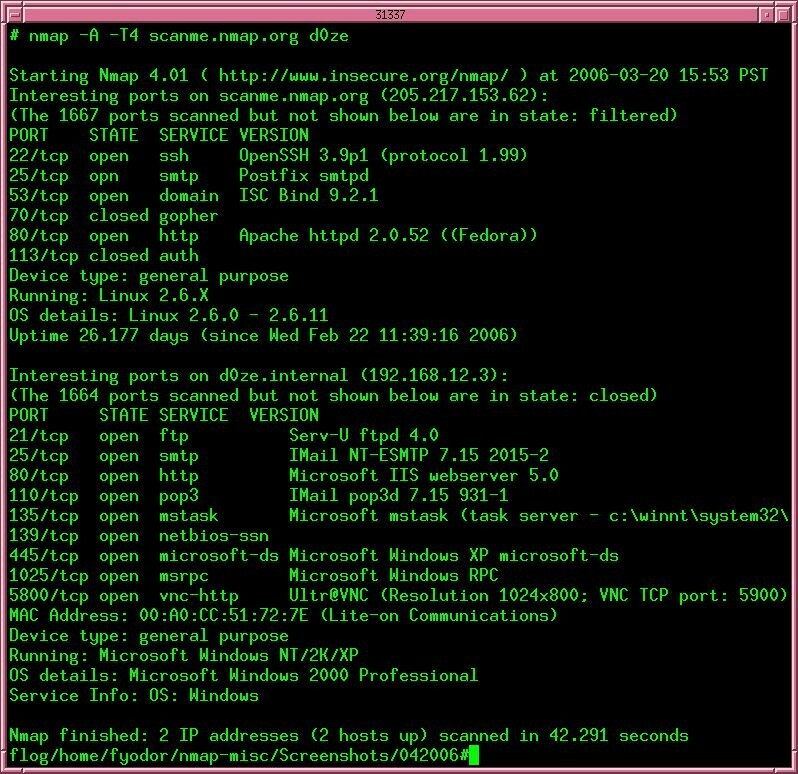 Nmap is a utility for network exploration or security auditing. It supports ping scanning (determine which hosts are up), many port scanning techniques (determine what services the hosts are offering), version detection (determine what application/service is runing on a port), and TCP/IP fingerprinting (remote host OS or device identification). Nmap project also offers flexible target and port specification, decoy/stealth scanning, SunRPC scanning, and more. Most Unix and Windows platforms are supported in both GUI and command line modes. Several popular handheld devices are also supported, including the Sharp Zaurus and the iPAQ. Free: The primary goals of the Nmap Project is to help make the Internet a little more secure and to provide administrators/auditors/hackers with an advanced tool for exploring their networks. 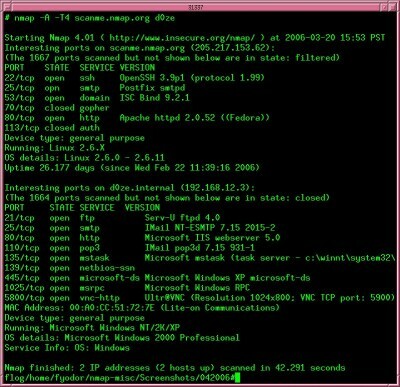 Nmap is available for free download, and also comes with full source code that you may modify and redistribute under the terms of the GNU General Public License (GPL). Supported: While Nmap comes with no warranty, you can write the author (fyodor@insecure.org) if you experience any problems. We also host several mailing lists you can join. Acclaimed: Nmap has won numerous awards, including "Information Security Product of the Year" by Linux Journal, Info World and Codetalker Digest. It has been featured in hundreds of magazine articles and is even recommended by Microsoft. Visit the press page for further details.